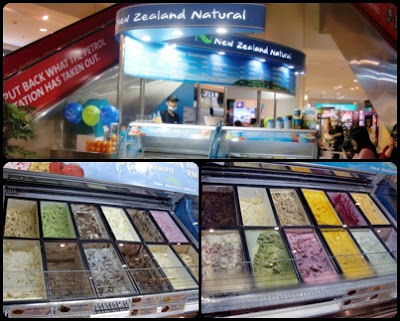 The ice-cream tasting event took place at the New Zealand Ice-Cream outlet @ The Curve Shopping Mall. And a bunch of feh-mes bloggers joined this event too. They are J-Loi, Iris, Tony, YeongBoon, Nana, Kelvin, Melissa, Benjamin, Michelle and Kelly! "A sinfully rich ice-cream filled with chunky pecan nuts and irresistible swirls of caramel fudge." Must be wondering what ice-cream is that eh? Its a creamy scoop of Pecan Praline Crunch ice-cream! Fresh strawberry, chocolate syrup, pecan nuts and whipped cream as toppings. DEFINITELY makes you feel like ROYALTY! 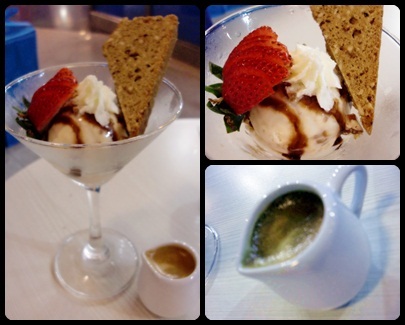 Plus, a mini jug of espresso shot + caramelised pecan nuts + chocolate syrup - near-to-perfect combination of toppings! 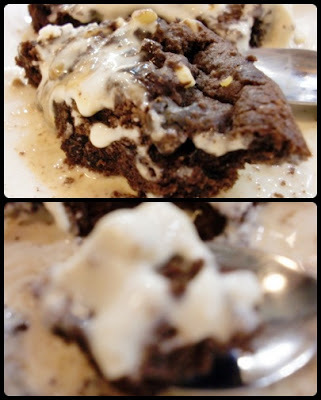 Definitely, a mouth-watering treat that nobody can resist! Besides, we have the opportunity to taste the other ice-cream flavours as well. Look how fine the ice-creams are. Not to forget, the workers are quite friendly and well-mannered too. 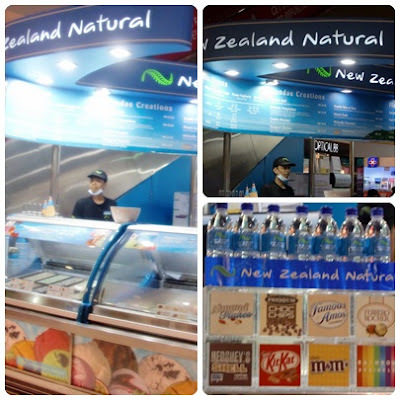 They provide good services to the customers. A friendly worker scooping the ice-cream. 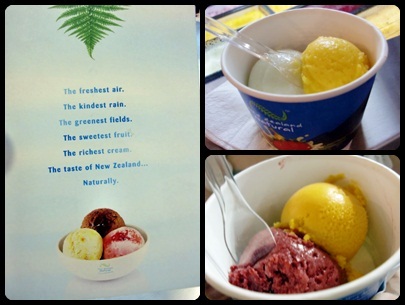 And they even let us try the ice-cream flavours that we want before proceed. Lots of ice-cream flavours to choose from. Friendly workers, large menu board, and a bunch of toppings to choose from. Owh yeah, on the 30th of every month, there will be 30% off for the regular tub & large tub of New Zealand Natural Ice-Cream! Also, a big THANK YOU to the marketing executives of New Zealand Natural Ice-Cream, Miss Chia Hui and Miss Candice for organizing this event too! Too bad I didn't managed to snap a photo with them. 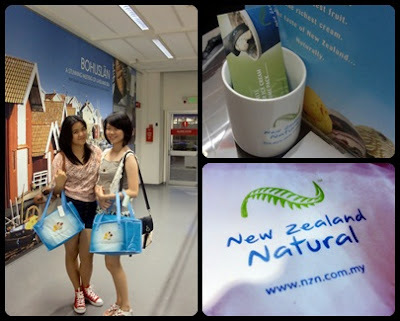 Cooler bags with some merchandises were given at the end of the event. 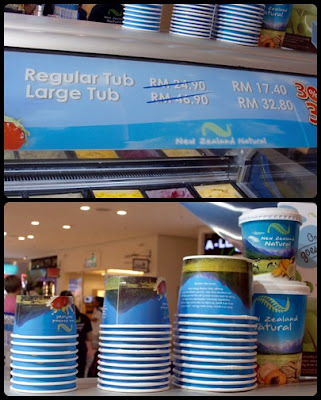 P.S Get cash rebates when you reuse this cooler bag on every visit to any New Zealand Natural Ice-Cream outlets in Malaysia! 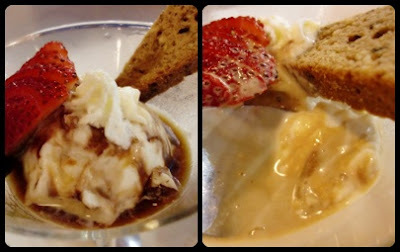 ok.. the icecream definitely makes me drooling.. i should not visit here.. now i need ice cream..
Pecan Praline for me pleeeeeeeeeese!! Gosh, I love ice-creams! Hey, u may wanna check out this yummy biscuits that I got to try during my blogging trip in Malaysia: Julie’s Biscuit, Bringing Back The Good-Old-Days! See u there!